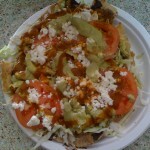 It was on a trip to the Santa Clara Farmer’s Market a week or so ago that I decided to start this blog. It has become a mini-Mecca for portable food, and so it deserves to be the first “real” post on this blog. I always pick up something for lunch while I’m shopping for my veggies. 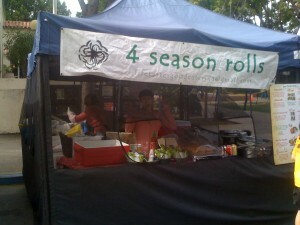 I usually stop and get a couple of Spring Rolls at 4 Season Rolls . I have been picking these up for about a year; I love the rolls and the folks who make and serve them – they are always willing to make our favorite (a spring roll without pork) and never complain about having to do a “special” for us non-pork-eating idiots. I miss them during the week, although an occasional trip to Tofoo Com Chay (not a truck, but the same size) does tide me over. I really don’t have much to add to their Yelp! page except that they really do make them huge with a lot of greens inside, and my wife and I really, really like these rolls. What pushed me “over the edge” last week was the appearance of a brand-new, beautifully-painted truck called “Oaxacan Kitchen Mobile.” When I saw this gorgeous truck nestled in among the vendors at the market, I knew I had to write about Mobile Food in Silicon Valley. Unfortunately, I already had plans for lunch that day, so I had to wait until today to try the food. 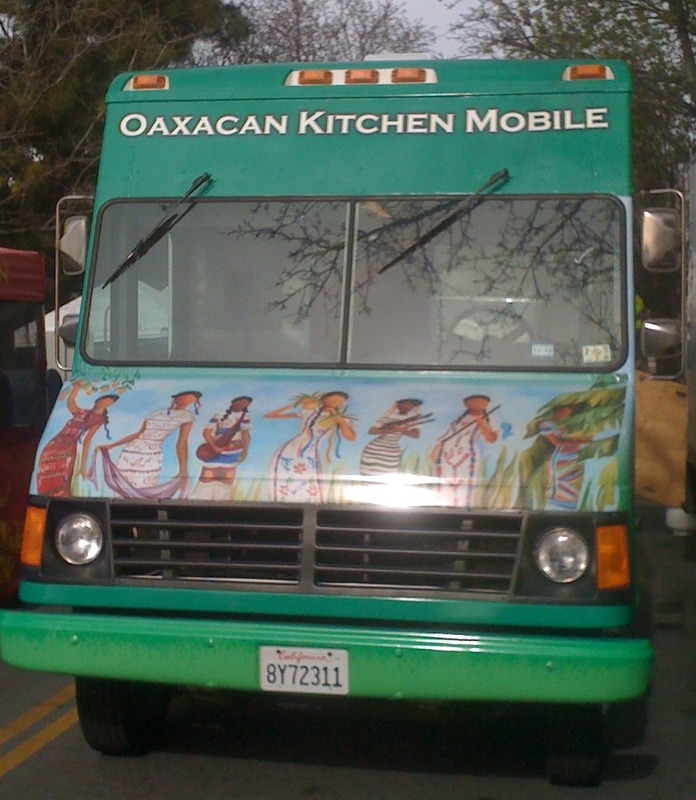 It has been a long week, because the pictures on the side of the truck and the smells from inside were more than memorable, and I was dying to get into some Oaxacan cuisine. 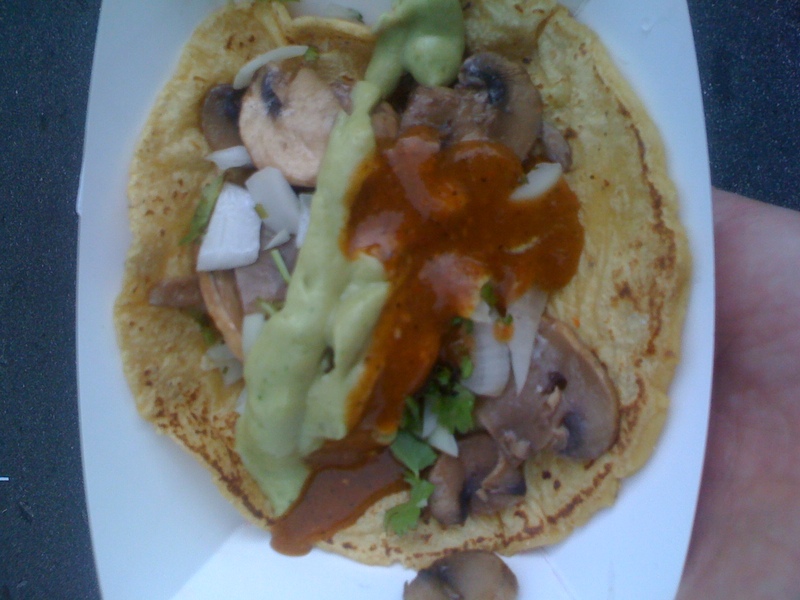 So today I went over and , before I even started shopping, got a Mushroom Taco , just to warm up. Wow! 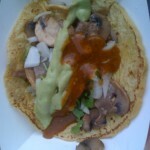 mushrooms, cabbage, raw onion, cilantro, guacamole, and Arbol chile sauce on a thick, homemade corn tortilla. Was it good? Oh, yeah! So I did my shopping (including stopping at 4 Season Rolls – hey, gotta have them, too…) and came back to get “real lunch.” I got one of their Chiles Rellenos and the Tlayuda, and took them home. 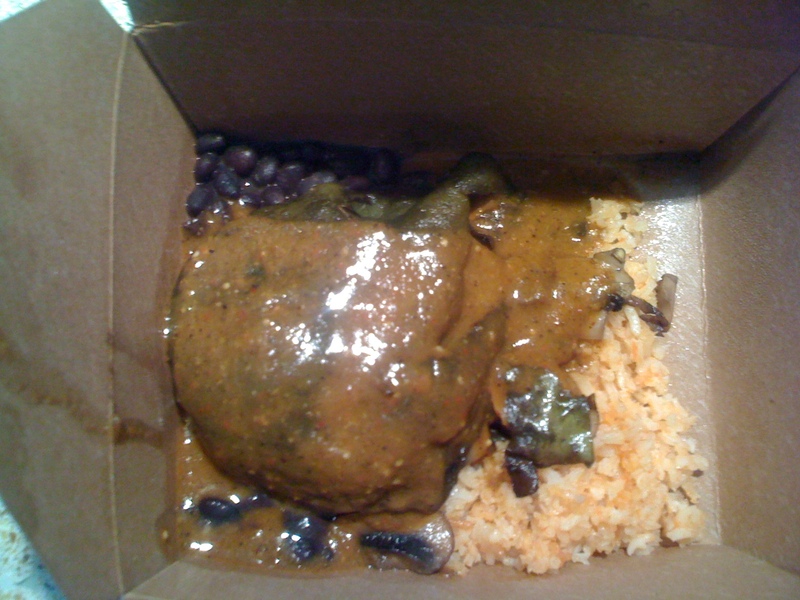 The chile relleno was filled with mushrooms and served with black beans and rice with an unbelievable sauce. 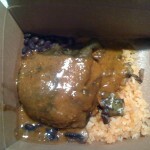 Note: unlike more northern chiles rellenos, this one is served without cheese. 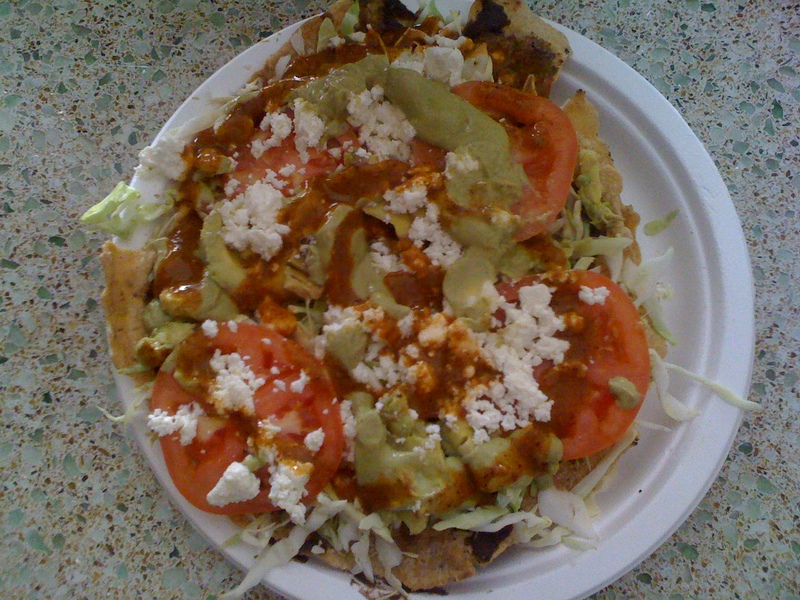 The Tlayuda, on the other hand, has cheese on top – along with tomatoes, cabbage, guacamole, salsa, all served on top of a layer of black bean paste smeared on crisp corn tortilla. The tortilla was the only small problem with the whole meal – those thick tortillas get a little tough when you crisp them up – took some effort to chew through them, especially at the edges. However, the dish is so tasty I bravely persevered. 🙂 It’s well worth it, unless your have weak teeth or expensive bridgework. 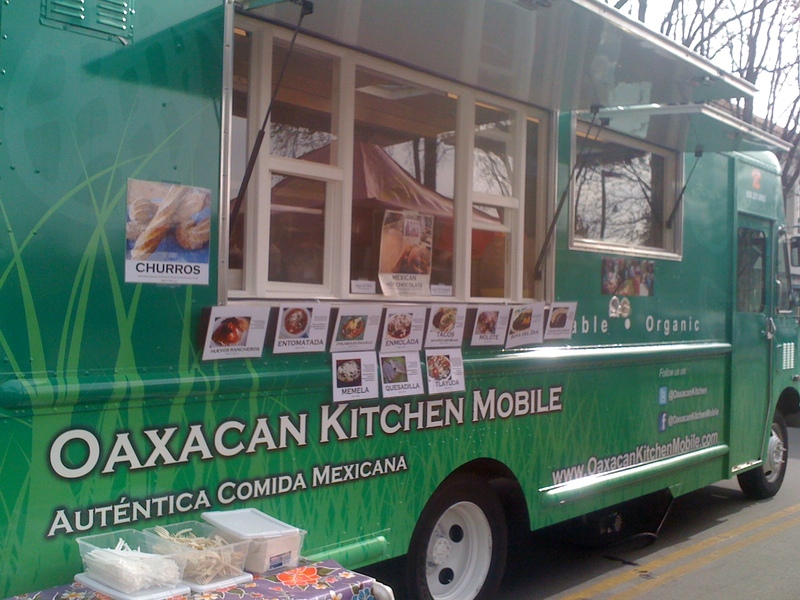 As I said, though, this farmer’s market is becoming a center for mobile food service – although Oaxacan Kitchen Mobile is the latest, there are several other vendors here worth mentioning, because they are just as good. 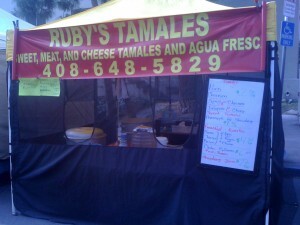 Ruby’s Tamales is another favorite of mine; two tamales makes a REALLY good lunch. 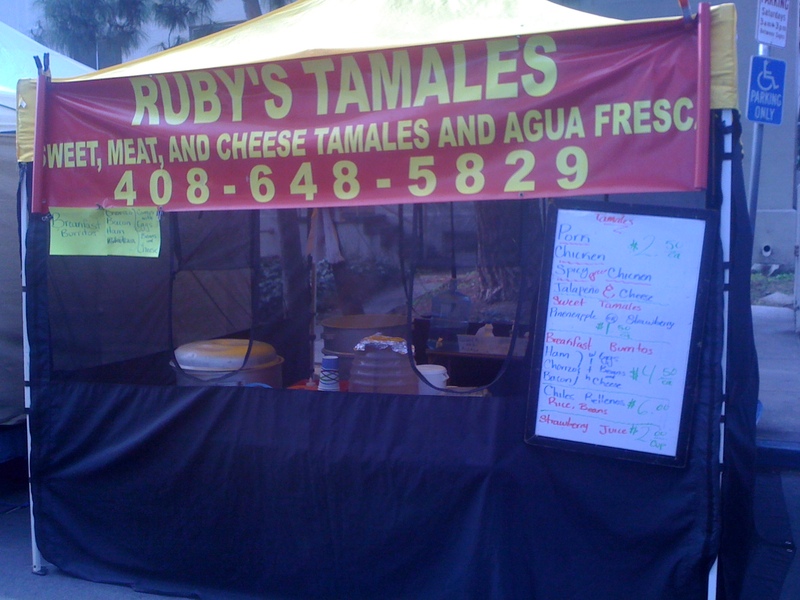 They sell tamales and drinks, nothing else, but they are so good they don’t need to sell anything else. 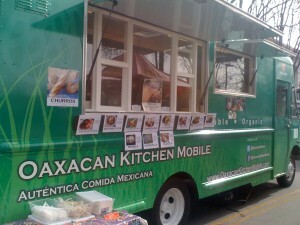 I have had their jalapeno and cheese tamales several times and recommend them to anyone. The Flying Falafel, right across from Ruby’s brings absolutely wonderful middle-eastern foods to the market: falafel, hoummous, baba ghanouj, all fresh and served on beautiful, soft pita bread. I have only had their falafels and a taste of the baba ghanouj – their falafels are generous and a full meal, at least for me. They also hand out small falafel balls as a “come-on” – you want to go by a few times and see if you can get a couple of them. They seem to make it to a number of farmer’s markets around the Bay. Great food, nice folks – what more could you want? 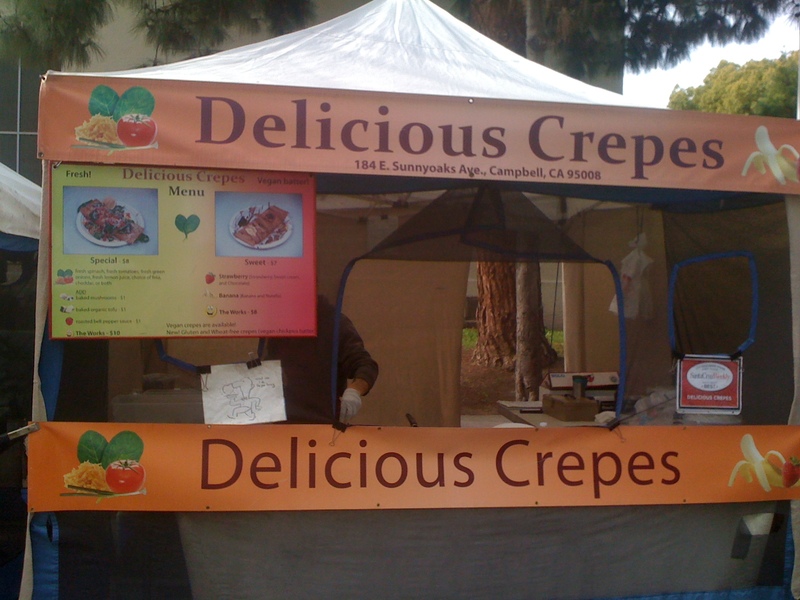 Well, if the answer to that question is, “Crepes,” then you’re in luck. The crepes from Delicious Crepes are undeniably delicious. They are not the light, fluffy crepes you may have had on the streets of Paris; these are like soft but substantial blankets wrapped around wonderful sauteed vegetables and cheese or strawberries, bananas, and other sweet stuff. And they are generous with their portions – one crepe is enough for a meal for me, and I’m a big guy. Absolutely scrumptious. 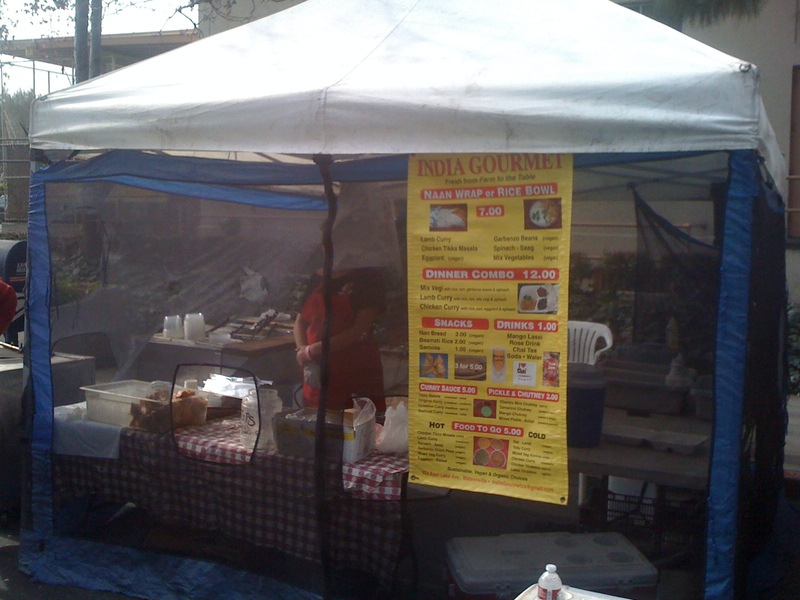 But the real embarrassment of riches at the farmer’s market is in Indian food , with TWO outstanding booths. The first you encounter is India Gourmet, which offers a surprisingly extensive menu. They cook the dishes right there, including a portable tandoori oven making Naan all morning long. The food is absolutely wonderful, and they are the friendliest people I have ever seen working so hard. This is another place to make sure you come by when they are handing out samples! 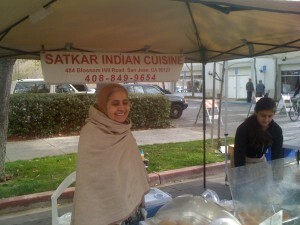 But the best is saved for last: Satkar Indian Cuisine. 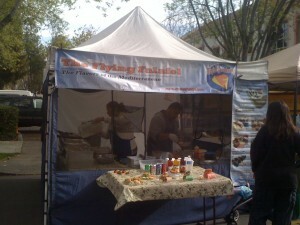 They bring items from their restaurant in south San Jose and sell them at the market. The food is excellent, and I particularly recommend the samosas: big and tasty, they’re particularly good with some spicy chutney. But what I like best about them is just the pure moxie – these ladies are out there every week, talking to the folks passing by and getting them to try their excellent food. Which of the two Indian stands is better is a matter of taste, and I think they are both outstanding and tend to divide my custom between them. So go to the Santa Clara Farmer’s Market on Saturday between 9 and 1, all year long, and enjoy some of the best the Silicon Valley has to offer. This entry was posted in gatherings, review and tagged 4 season rolls, asian, crepes, Delicious Crepes, Flying Falafel, food trucks, India Gourmet, Indian, mediterranean, mexican, Oaxacan kitchen mobile, Ruby's Tamales, Santa Clara, Satkar, silicon valley. Bookmark the permalink.